It's time for Monday's Month In Retrospect. Let's look back at the previous month and see what I considered the Best Ofs for what I read in November 2011. Remember, these are my best ofs on books I read last month, regardless of release date. Why it was my favorite: I love dystopians, but I especially love this one. It's so character driven and I love stories like that. Why she's my favorite: I have loved her since the first book. And she grows even more in this book. You can't help but root for her. 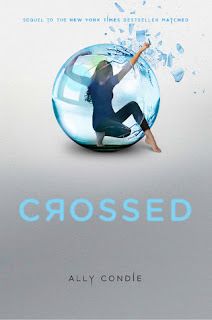 Gotta give it to Ky from Crossed. Why he's my favorite: He's not your typical hero. He has flaws, but such strengths too. The bad person in Glow. I can't get more specific in case there are folks who haven't read it. What made them a great villain: The worst kind of villain...the kind that has a perfect justification for the bad things that they do. Why it's my favorite: Whoever designs Ally Condie's covers must have read the books and just "gotten it." In Matched, the girl is inside the ball, her hands stretched across and touching either side, as if testing for weakness and trying to find a way out. It perfectly matched the story of Matched itself. In this one, she's got a foot out of the sphere, breaking out. So perfect to the story.